We recently wrote about the rapid uptake of mobile broadband and its expected journey toward revolutionizing the digital divide in sub-Saharan Africa. 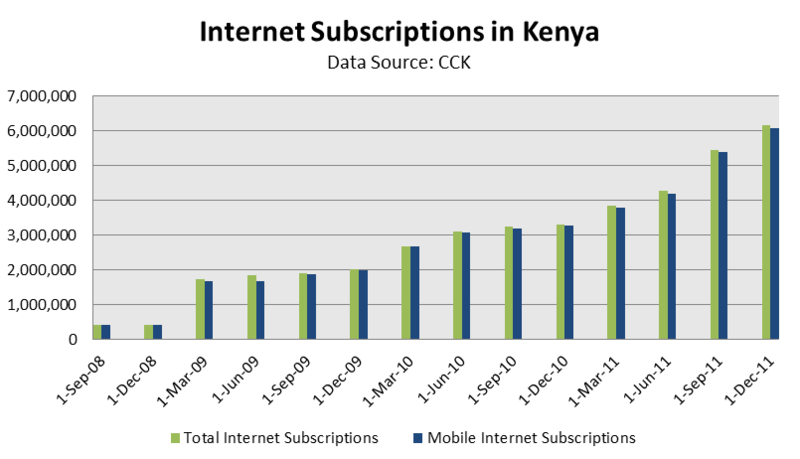 Kenya, in particular, shows signs that mobile broadband is the key to increasing Internet access and ICT sophistication. 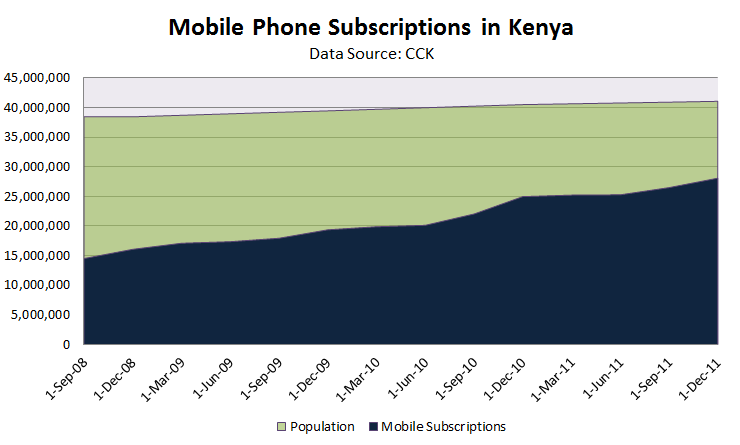 In this post we’ll share the stats and driving forces behind mobile broadband’s success in Kenya. Kenya is one of the leading nations of sub-Saharan Africa in telecommunications and Internet development, particularly in the mobile sector. In terms of telephony, mobile phone subscriptions are rising quickly. Today, almost 70 percent (27+ million) of the Kenyan population has a mobile phone, up from just 40 percent (14+ million) in 2008. On the other hand, less than 1 percent of the population subscribes to fixed line telephone services with no signs of growth. As we mentioned in the last post, East Africa’s Internet bandwidth has increased dramatically over the past five years. While infrastructure is increasing the capacity for both fixed and mobile broadband services, 99 percent of data/Internet subscriptions are mobile-based. The Communication Commission of Kenya’s standard for measuring the population’s access to Internet assumes that for every Internet subscription, two people gain access to the Internet. Using this standard, over 30 percent of people in Kenya had access to Internet (95+ percent mobile) at the end of 2011, up from 2 percent in 2008. All of the stats above show mobile’s promising progress in closing the digital divide. Certain factors regarding infrastructure, government policy, and accessibility have created an environment conducive to the growth of mobile in Kenya, as addressed below. According to the Communication Commission of Kenya, bandwidth connectivity has increased over 4,500 percent since 2008. 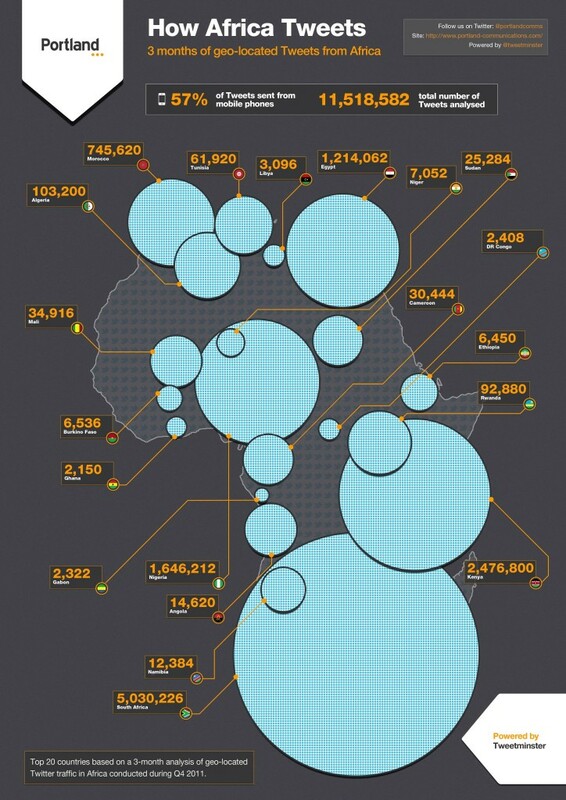 At the end of 2011, total international bandwidth connectivity in Kenya stood at 52,938 Mbps, one of the highest in Africa. Total available bandwidth is actually 100 times higher, 5,261,919 Mbps, leaving significant potential for growth as more of the country adopts data-enabled phones. Alongside capacity improvements, broadband speeds are also increasing, now up to over 4 Mbps. Bandwidth has already increased so far in 2012 with the addition of international submarine cables like LION2, with many others to be completed before the end of the year. Kenya exemplifies the importance of open markets and government policy that supports competition and growth. The Communications Commission of Kenya (CCK) is a state entity that was established in 1999 to oversee the telecommunications industry in the country. Since its inception, major private companies have been able to enter the Kenyan market fairly. The CCK heads up licensing for all Internet Service Providers (ISPs) and telecoms, and is credited with licensing 30 ISPs to make Kenya one of the largest Internet sectors in Africa. The CCK is credited with liberalizing the market and thereby increasing mobile phone penetration dramatically in the last decade. CCK’s liberalized market creates competition, ultimately improving offerings and coverage for customers as the competitors fight for gains in market share. With voice revenues declining, the four major telecoms are now competing for market share in the mobile broadband sector. 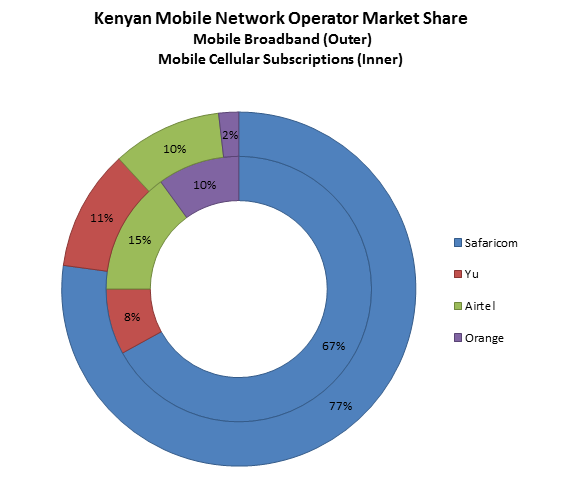 Safaricom, Airtel, Orange, and Yu are not only vying for market share of voice and SMS users, but also for mobile data users. Safaricom, for example, is losing market share for mobile subscriptions, and is now trying to differentiate itself with offerings like M-PESA and fast and affordable mobile broadband. As a result of the strong competition, the telecoms are differentiating themselves by offering data packages and bundles at competitive rates as well as appealing prices on data-enabled phones. Safaricom famously offers the $80 Ideos Android phone. 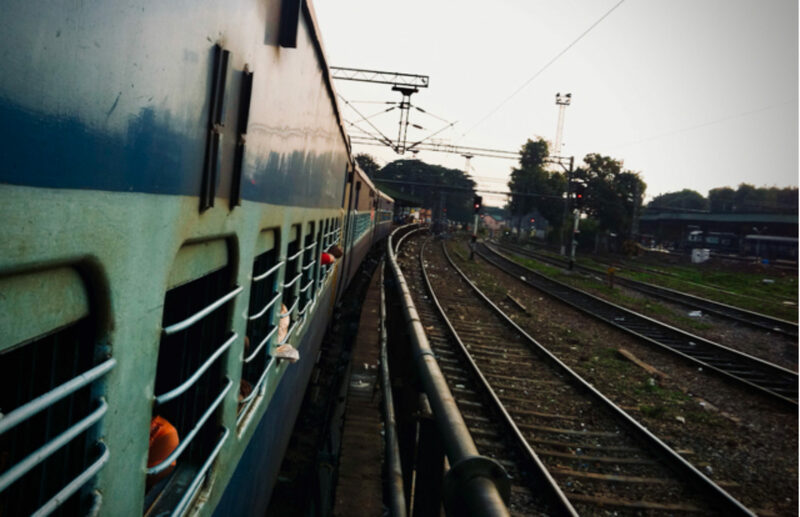 Anecdotal evidence also points to the massive uptake and reliance people have on mobile broadband and mobile in general as a key means of communication. Politicians, CEOs, journalists, and businesses are active on Twitter and use the platform as a means of communication where other channels are lacking, and Kenya is home to the second largest Twitter user base in Africa. Infrastructure, government policy, and accessibility have allowed mobile communications – both voice and broadband – to become a part of Kenyan lifestyle. Due to the combination of utility and high user rates, “it is predicted that mobile broadband can potentially increase national productivity and growth by up to 15%.” (iHub, 2011). As mobile communications continue to influence everyday life in Kenya, we’re optimistic that there will be continued success for consumers, entrepreneurs, and enterprises alike; ICT improvements bring an improved quality of life along with better business operations both big and small.